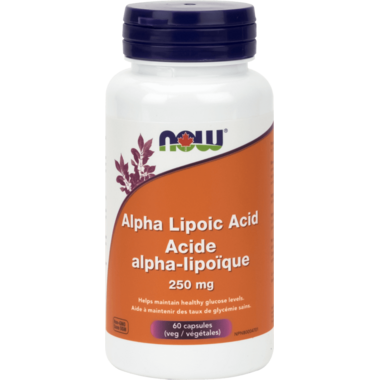 NOW Foods Alpha Lipoic Acid Veg Capsules provide a synergistic formula that is enhanced with the water-soluble antioxidant Vitamin C, and the fat-soluble antioxidant Vitamin E. These two powerful antioxidants augment Alpha Lipoic Acids dual-action in fat and water-soluble tissues. Elevated blood glucose has been implicated as a leading indicator of metabolic syndrome, increasing the risk for a number of degenerative diseases. According to a survey of 685 herbalists, alpha lipoic acid was one of the 10 most frequently recommended dietary supplements due to its efficacy in reducing high blood sugar levels. Directions: Adult Dosage: Take 1 capsule, 2-3 times daily with meals. Caution: Consult a healthcare practitioner prior to use if you are diabetic, alcoholic or taking any other medications. Do not use if you are pregnant or breastfeeding. Easy to take after meals.